Turmeric, or curcuma longa, belongs to the ginger family.It has been an integral part of Indian meals for thousands of years and is used in ayurveda. Known as ‘haldi’ in India, it is grown in many Asian countries. Its vivid yellow colour is lent to curries, cheeses, butter, etc. The market product that we see is obtained after carefully removing the rhizomes from the ground to avoid bruising them and then putting them through the process of sweating, boiling, drying and polishing. The miracle component of turmeric is a compound called curcumin. It can be found in varying proportions in different varieties of turmeric, for example, Allepey from Kerala has 6.5% of curcumin and Madras from Tamil Nadu has 3.5% of curcumin. To garner the maximum benefit of turmeric, it is essential to have it with black pepper, which enhances the absorption of curcumin because of the presence of piperine. Turmeric has tremendous nutrient value with vitamin K, vitamin c, vitamin E, niacin, protein, dietary fibre, potassium, magnesium, copper, iron and zinc. It has antioxidant and anti-inflammatory properties. Curcumin can neutralise free radicals that cause damage and also can encourage the functioning of antioxidant enzymes in the body. Incorrect regulation of NF-kB, a protein complex, can cause inflammation, autoimmune diseases and septic shock. Curcumin has the ability to block NF-kB. Brain-Derived Neurotrophic Factor (BDNF) is a hormone that promotes the growth of neurons. Curcumin is said to enable the increase in this hormone so as to battle depression and Alzheimer’s. It is said that it can clear beta-amyloid plaques that contribute to Alzheimer’s disease. Curcumin has the ability to slow the progress and even prevent different types of cancer. Moderation of insulin levels is possible with turmeric as well as reduction in insulin resistance, which could prevent the onset of Type-2 diabetes. (Caution: overdose could cause low blood sugar). Turmeric can reduce cholesterol buildup that can lead to arteriosclerosis. It could be possible to reverse to some extent the debilitating effects of heart disease as curcumin facilitates the operation of endothelium, the lining of blood vessels. People suffering from rheumatoid arthritis can get some relief through the ingestion of curcumin. Turmeric’s antiseptic and antibacterial properties make it a useful home remedy for healing wounds. Warm milk with turmeric is seen as a remedy for fever and colds because of turmeric’s antiviral, antifungal and antibacterial elements. 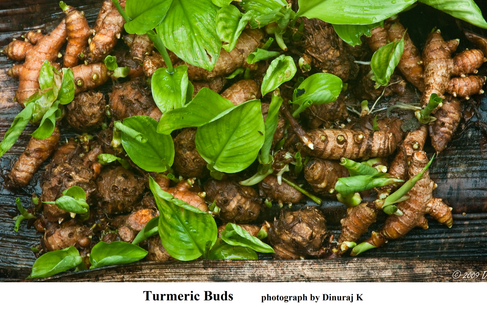 Turmeric is used to alleviate stomach problems and treat skin infections such as ringworm. Turmeric should be used cautiously because it can slow down coagulation of blood and could worsen gall bladder problems and gastroesophageal reflux disease. Ingredients: 2 tsp of black lentil (urid), 1 tsp of fenugreek leaves (dry), 1 tsp sunflower or coconut oil, ¼ tsp of asafoetida, 2 pinches of mustard seeds, ¼ tsp of turmeric powder, 4-5 red chillies (optional), 1 cup of coconut paste and 1tsp of tamarind powder ( you can use other sour fruits as well). Preparation: Roast the black lentils, fenugreek, chillies and turmeric in a frying pan. Grind this mixture and add 2 cups of water, coconut paste, sugar, salt and tamarind powder or sour fruits. Heat oil in another frying pan and when it is hot add mustard seeds, asafoetida and the mixture. Cook it for 10 minutes. Ingredients: 10 pieces of kokum, 2-3 flakes of garlic, ½ tsp chopped green coriander, 1 cup of coconut milk, 1 green chilli (optional), sugar and salt to taste. Preparation: Keep the kokum pieces immersed in water for half an hour. Add sugar and salt as per taste. Stir in half a chilli, coconut milk and coriander. Curry Leaves: Eating 5 curry leaves every morning is said to be good for controlling diabetes due to hereditary factors. Lemongrass oil: Lemongrass oil helps get rid of acne. It opens pores and is good tonic for the skin. It also improves muscle tone in slack tissue and is an excellent antidepressant. It fortifies the nervous system and relieves stress. Mix two drops of lemongrass oil with 10-15 drops of almond oil and massage the face before going to bed.